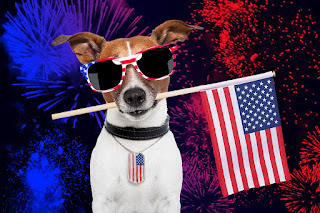 Companion Animal Hospital Blog: Fireworks Fun (and Safety)! In the midwest, summer is full of celebrations involving fireworks. We LOVE our fireworks! Unfortunately, most of our pets do not. Some aren’t upset by the explosions, while others are so scared they may injure themselves. We have seen pets that have jumped through plate glass windows from their fear of the explosions. Other times, we discuss the fear that sends our four legged friend cowering under the covers. Signs of anxiety can include pacing, trembling, panting, drooling, attention-seeking (vocalizing, pawing, nuzzling, and climbing on people), hiding, and bolting. Hiding in closets, basements, and bathrooms is common. Because the source of the noise is confusing, inside dogs may want to escape to the outside, and outside dogs may be frantic to get inside. Keep your pet on a secure leash whenever outside, even in a fenced-in yard. Even the best trained dog may bolt from fear of the exploding sound and lights. Pet advocacy groups report the number of escapees around Independence Day is so high that it is the busiest day of the year in shelters. Worse, your pet could be injured or killed after escaping and fleeing from fear. Make sure your pet is wearing identification. Permanent identification, such as a microchip, is best. Visible identification, such as tags, should be worn at all times. Try to be home with your pet during the busiest fireworks times. That's not always possible, so plan ahead before leaving them alone. Allow your pet to hide in a safe place. For example, If your pet feels more comfortable hiding in the bathtub, provide him/her with cushions/blankets. Be prepared ahead of time and put their usual bed in the preferred hiding space. Some pets find relief by increasing the white noise in the house, drowning out the fireworks. Music or white noise players are options. Not all pets will find relief from more noise. Synthetic phermone sprays such as Feliway (for cats) and Adaptil (for dogs) are available online and in pet stores. This natural remedy can provide extra sense of security. Some pets feel comforted by pressure wraps, such as a Thundershirt. Ear muffs or calming caps are also available, and some pets find them helpful. Herbal supplements, such as Rescue Remedy or Composure Chews can provide extra relaxation. These are most effective if given prior to the noisy event. Prescription medications are available for severely anxious pets. Please plan ahead and make an appointment to discuss medications with your veterinarian if you think your pet would benefit from use of these medications. For more permanent, long term relief, veterinary behaviorists recommend behavior modification, classical counter conditioning, and teaching a desirable coping response. Please discuss a proper behavior modification plan with your regular veterinarian. In severe cases, referral to a veterinary behaviorist will be recommended. In behavior modification, controlling the intensity of the fireworks is necessary. This is challenging during the event, so this part of training should be accomplished in the “off months.” Acquiring recordings of fireworks can be accomplished via YouTube, or CDs, or other recordings are available for purchase. Start by playing the recordings at a very low level, and then while performing counter conditioning, gradually (over weeks) increase the intensity of the noise. Classical counter conditioning teaches a positive association with fireworks. Give high-value food rewards (canned food or peanut butter), offer your pet his favorite toys or food puzzle toys, or have your pet practice his tricks with you. The goal is for him to learn that fireworks result in highly pleasant rewards. You can also teach a desirable coping response. The appropriate response for a dog facing something frightening is to retreat to a safe place until the frightening event ends. Providing a safe retreat, such as a crate or a closet, will give security and confidence. Selecting the location is up to the pet. Blankets to muffle the sound and a pheromone diffuser will provide natural motivation for the dog to seek this location. Being able to cope when the world becomes overwhelming is a life skill essential for both people and dogs! 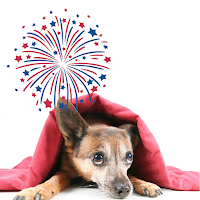 Hiding is not a sign of a problem, if the pet quickly returns to a normal behavior when the fireworks are over. 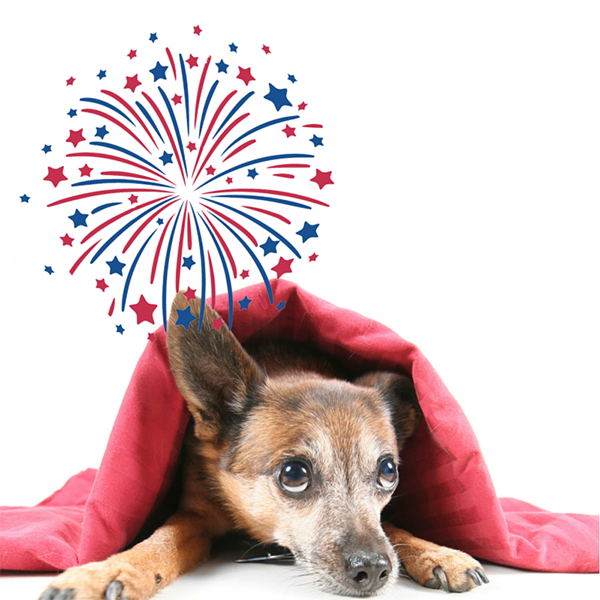 You have many choices of how to help your pet cope with fireworks stress. Talk to your veterinarian about what is best for your pet. Hopefully, everyone in the family will then be able enjoy the holiday!